Assunção, Matthias Röhrig. 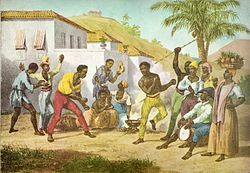 Capoeira : A History of an Afro-Brazilian Martial Art. Routledge. 2005. ISBN 0-7146-8086-9. Capoeira, Nestor. The Little Capoeira Book. 由Ladd, Alex翻译 . North Atlantic. 2003. ISBN 1-55643-440-5. Talmon-Chvaicer, Maya. The Hidden History of Capoeira: A Collision of Cultures in the Brazilian Battle Dance. University of Texas Press. 2007. ISBN 978-0-292-71723-7. Almeida, Bira "Mestre Acordeon". Capoeira: A Brazilian Art Form. Berkeley: North Atlantic Books. 1986. ISBN 0-938190-30-X. Downey, Greg. Learning Capoeira: Lessons in cunning from an Afro-Brazilian art. Oxford University Press. 2005. ISBN 0195176987. Merrell, Floyd. Capoeira and Candomblé: Conformity and Resistance in Brazil. Princeton: Markus Wiener. 2005. ISBN 1-55876-349-X. Mason, Paul H. Intracultural and Intercultural Dynamics of Capoeira (PDF). Global Ethnographic. 2013, 1: 1–8. Stephens, Neil; Delamont, Sara. Balancing the Berimbau Embodied Ethnographic Understanding. Qualitative Inquiry. 2006, 12 (2): 316–339. doi:10.1177/1077800405284370.